Universities from around the world came together on April 5 this year in Wageningen, Netherlands to plot a course for food safety at the “2018 Global One Health Research, The Future” international symposium. 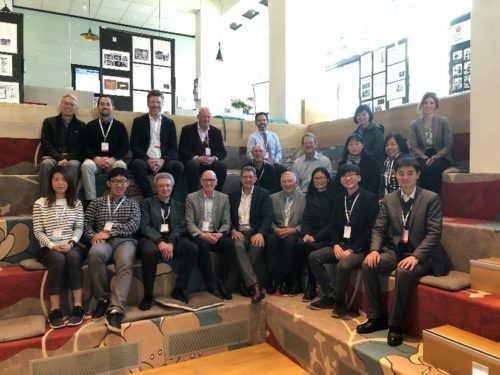 WIFSS faculty researchers joined other UC Davis faculty in a consortium of prestigious institutions including Wageningen University, China’s Nanjing Agricultural University, and New Zealand’s Massey University with the goal of confronting food safety issue in an increasingly globalized world. Taking a One Health approach, this conference explored innovations being made to improve the future health of humans, animals, and the environment. It also stressed the importance of cooperation between researchers, industry, and various stakeholders worldwide. Dr. Rob Atwill presenting at the international symposium. Truly taking an all-inclusive One Health perspective, the conference covered a wide variety of topics ranging from plant health to climate change. Dr. 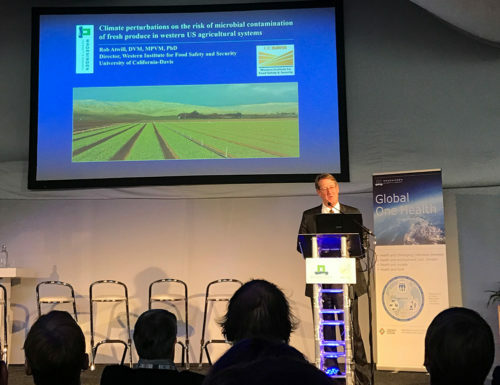 Rob Atwill, Director of WIFSS, was a keynote speaker and delivered a lecture entitled, “Climate perturbations on the risk of microbial contamination of fresh produce in the western US agricultural system.” Dr. Bennie Osburn also gave a talk on global one health research and education. The goal of sharing ideas and innovations on food safety and One Health was more than achieved as professionals from diverse schools of knowledge presented their research. Further representing UC Davis, PhD graduate student in the soils and biogeochemistry program, Rachel Danielson, presented her research on microbes and pasture-converted Amazon soils, and PhD graduate student, Dr. Kyuyoung Lee, spoke about the wild-domestic-human interface of Influenza viruses. Nanjing Agricultural University graduate student, currently participating in the 3+X One Health program at UC Davis, Yitong Huang, also contributed insights on African swine fever. The myriad of lectures ended with a lively discussion during which participants were able to exchange opinions and plan strategies to address these global health issues. The successful conference ended with a clear message: the only way to ensure safe food on a global scale is to approach it with a global perspective. The consortium of these four universities is already preparing for the future as people, animals, and the environment become more and more interconnected each day. The next conference is currently planning to be held at Massey University in New Zealand.